New York Magazine’s Top Ten Video Games? Half ignore seizure safety guidelines! Thumper, #9 on New York Magazine‘s top ten games list, has many flashing images that could trigger seizures in users. The image here is seen during a sequence that failed the seizure guidelines compliance test. Five of New York Magazine’s top ten video games of 2016 don’t meet guidelines for reducing the risk of visually provoked seizures. Developers of these popular games could have designed the visuals in a way that lowers the seizure risk to users, but didn’t. Guidelines for reducing the risk of seizures triggered by video images were published in 1994, when the UK required that all TV programs and advertisements meet those visual safety standards. The same guidelines for making television images safer could easily be adhered to when developing video game visuals. No regulations on seizure-inducing images in video games have ever been enacted, so game developers have no incentive to work within the guidelines. Instead, for many years game publishers have provided a seizure warning that makes it extremely difficult for consumers to take legal action in case of a seizure. Some games may in fact conform to seizure-reduction guidelines, but because the seizure warnings appear on all games, consumers can’t know which ones are riskier. 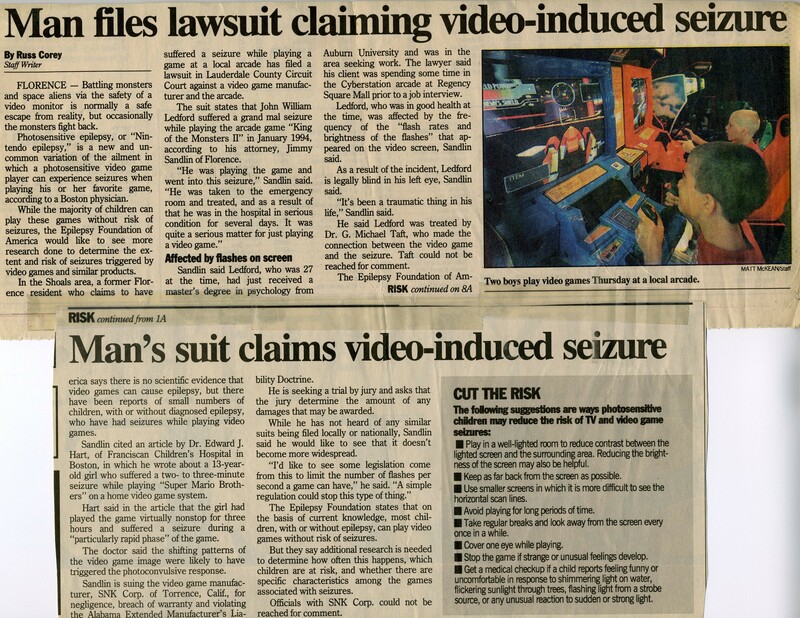 The warnings began appearing in 1991 in response to the first video-game-seizure consumer lawsuits. Many popular games don’t meet the guidelines, as demonstrated by my testing of New York Magazine‘s favorite games. A couple of the failing games were among the top five first-person shooter games selected by Forbes. I tested video clips from gameplay and promotional trailers for the games on the list using software that identifies video sequences that don’t comply with the guidelines. The software is designed for game developers and video producers to test their moving images for compliance. Note that for the games that didn’t violate the guidelines, rather than list them as passing the compliance test, I’ve indicated that they did not fail the test. Although in previous posts with test results I’ve listed games that “passed” the guidelines test, I’m no longer using that terminology. That designation could too easily be misinterpreted to mean that such games will definitely not cause seizures. The guidelines aren’t fool-proof. They are designed to prevent seizures in approximately 97 percent of people who have photosensitive epilepsy, the condition where visual stimuli can trigger seizures. Do you need to worry about seizures from video games? The vast majority (97 percent) of people diagnosed with conventional epilepsy can play video games without risking a seizure because–unless their EEGs indicate otherwise–their seizures aren’t triggered by visual effects. These people don’t want others questioning their fitness for gaming. People with no history of epilepsy may be most at risk. Seizures can be triggered by flash and flicker even in people with no history of seizures, which means that many don’t know they are at risk of having a visually triggered seizure until a video game brings on their first event. Of the children who had seizures during the 1997 Pokémon cartoon broadcast in Japan, only 24% had previously experienced a seizure. Visually triggered seizures typically begin between ages 2-18, and most commonly begin around age 12-13. Of patients age 7-19 who seek medical attention for a seizure, ten percent test positive for photosensitive epilepsy. Researchers estimate that only 25 percent of people outgrow the condition, typically in their twenties. It is relatively unusual but not unknown for these seizures to develop in adults. Because in many individuals a number of factors (for example, emotional state and hormone levels) affect seizure vulnerability, a seizure may not actually occur until several of these factors are present simultaneously. Even one seizure can be life-changing if it results in injury or permanently bars an individual from certain occupations. It is also possible to experience subtle seizures and not realize they happened. This doesn’t mean there are no seizure consequences, though. Typically after seizures one’s physical, cognitive, and emotional functioning can be impaired. Want to know more about how I test video games? Read here. Or read more about the image safety guidelines.